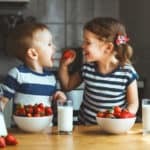 Traveling with one child can be a challenge, but parents of more than one kid understand that taking trips with multiple little ones is indeed a test of patience and multitasking abilities. Having an excellent double stroller for air travel and road trips can make life much more comfortable. We’ve hand-selected the best double strollers in a variety of prices for travel, by plane, train, or automobile to make your life easier. Whether you need a double stroller, you can fit in an overhead compartment, or the best for road trips, these are our recommendations. 9.0.1 Q: What should I look for in a double travel stroller? 9.0.2 Q: How do I go through airport security with a double stroller? 9.0.3 Q: Can you check a double stroller at your airline gate? 9.0.4 Q: Will a double stroller work with both an infant and a child? 9.0.5 Q: Can you put a double umbrella stroller in an overhead bin? 9.0.6 Q: What should I bring with me on a flight or road trip with kids? 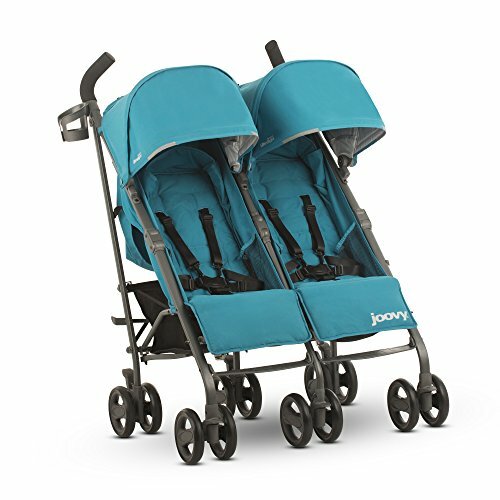 Joovy’s Scooter X2 Double Stroller is loved by parents who want a side-by-side buggy that is foldable and sturdy for heavy-duty travel. With independent reclining seats, you do not have to worry about fighting amongst siblings over who wants to sit upright or who wants to the laid-back position. This stroller holds two children up to 45 pounds each, for a total of 90 pounds. The Joovy Scooter X2 Double has a vast storage basket under the seat, a large sun visor with a peek-a-boo window, rear parking brakes, two cupholders for parents, and a quick fold design. The Joovy Scooter X2 does weigh a bit more than some travel strollers. We like this option for those who will do more traveling that might beat up a stroller a bit or taking fewer trips that require a lot of hefting of the stroller. For example, if you make a lot of car trips and even train travel with a baby, but not as much air travel, this is an ideal option to consider. This stroller lives up to its lightweight name at only 11 pounds. That means the Zoe XL2 Best V2 Lightweight Double Travel Stroller weighs less than standard airline limits and is easy to lift to store in overhead compartments (if the room is available). We love this stroller for those who do a lot of air travel with two or more kids. With a weight capacity for kids of up to 50 pounds per seat, children can ride in this stroller for several years once they’re sitting upright. The opened width of this stroller is 29 inches, which is about an inch smaller than the standard doorway, making it easier to move through hallways and in and out of buildings. The canopy on this double travel stroller is massive, which is another bonus if you take trips to exceptionally sunny, windy, or rainy locations. The Delta Children LX Side by Side Tandem Umbrella Stroller is ideal for parents who want an extremely affordable double stroller for travel. This model does not have all the extras that some higher-end strollers boast, but sometimes with a travel stroller, a simple design can be better. This Delta Children LX Side-by-Side umbrella stroller weighs around 25 pounds—about middle-of-the-road for the weight of a travel stroller. It does have a cup holder for parents and a small sun canopy for the kids. This umbrella travel stroller is better for tinier children, as the leg room between the seat and footrest is not exceptionally long or adjustable for older kids. If all you need is a compact folding double stroller for smaller kids, and most importantly a pram that will not break the bank, this is a fantastic option. This one is excellent for parents who might be traveling alone with more than one child and need a cheaper alternative that is also lighter than the most heavy-duty models. We like Joovy for their quality design and high ratings, while generally remaining in an affordable range for most parents. Umbrella strollers are fantastic for travel. The problem with some of them is the lack of recline for infants. The Joovy Twin Groove Ultralight Umbrella Stroller has almost a full recline so you can travel light with an umbrella stroller that also meets the non-upright needs of infants. This double umbrella stroller weighs 26 pounds but can hold children up to 50 pounds each. 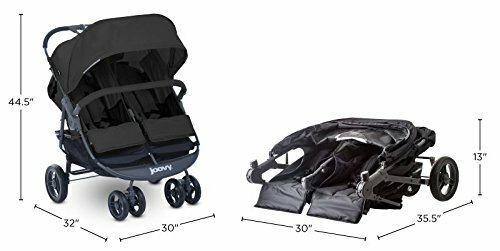 The Joovy Twin Groove Ultralight has an ample sun canopy and double pouches on the back of the seats for storage. With three cupholders and cushioned backrests, this umbrella stroller is a step up from some of the more economical models, without being overly expensive. The Graco DuoGlider Click Connect Stroller is ideal for parents who want an in-line, or tandem, double travel stroller. This tandem travel stroller weighs 27.4 pounds, so we especially like it for car travel or trips where you will not have to do a lot of excessive overhead lifting. This double travel stroller is compatible with two SnugRide™ Click Connect infant car seats for those who have twins, making it a dream stroller for road trips with two infants or toddlers. The narrow design of a tandem double stroller is desirable for a lot of parents while traveling, and the DuoGlider measures only 20.5 inches wide. So, getting through doors is more comfortable with this tandem model compared to many side-by-sides. 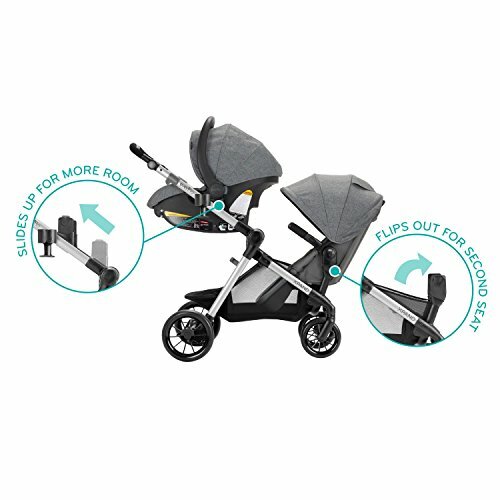 The Graco DuoGlider Click Connect has individual sun canopies, and the rear seat fully reclines into a sleeping position for worn out babies. We like that this double travel stroller comes from a reputable company. If you decide you do not like this model or have issues with the parts, you can contact Graco without worrying about an off-brand seller. Narrow design fits easily through doorways. Compatible with SnugRide™ Click Connect infant car seats. Cupholder for parents and each child seat. Full recline in the rear seat. Lap belt only, no five-point harness without car seats. Not the more durable wheels on the market. Difficult for some users to fold down. 4 Modes Of Use - Toddler seat easily converts to infant mode, cradling baby at a more comfortable angle - and both modes can be used forward-facing or parent-facing for ﬂexibility! The Evenflo Pivot Xpand Modular Stroller is excellent for parents who want a travel system stroller that can change to a handful of different modes (hence, the reason they are also called modular strollers) but who also need a baby buggy that works for traveling on road trips and flights. Many travel system, or modular strollers, can be cumbersome. While Evenflo’s Pivot Xpand is not the lightest double travel stroller listed here, it is quite lightweight for a travel system stroller. It weighs only about 28 pounds and can convert from a single stroller to a double. The Pivot Xpand also folds down for stowing as luggage or putting in the trunk of your car. This style of stroller is suitable from newborn up to children up to 55 pounds. With a modular stroller, you can also change the direction a child faces. So, if you are taking a trip with a baby who cries if they do not see Mom or Dad, this can be a massively stress-reducing option. These types of strollers are excellent for expanding families, and likewise, for those who need a double stroller now, but will have an older child outgrowing the stroller in a year or two. This double stroller can convert back to a single if you have a more significant age gap between kids and will need a single stroller in the near future. Baby Trend’s Sit and Stand Double Stroller is a brilliant option for those who want a lot of versatility in their double travel stroller. Many infant car seats are compatible with this model so you can click in a car seat (or two). Conversely, if you have an older child, they can sit or stand in the rear. This is a fantastic feature in a stroller if you are heading through busy areas and would rather your walking child stay in the stroller, without the battle of forcing them to sit buckled in a seat. This is on the heavier side, so if you have trouble lifting heavy items, the Sit and Stand might not be your best bet. However, if your primary concern is keeping a rambunctious toddler or small child contained while you stroll a baby in populated tourist destinations, this can be a fantastic double travel stroller. A side-by-side double stroller explains itself in the name. The two seats of this buggy sit next to each other, rather than one behind the other. 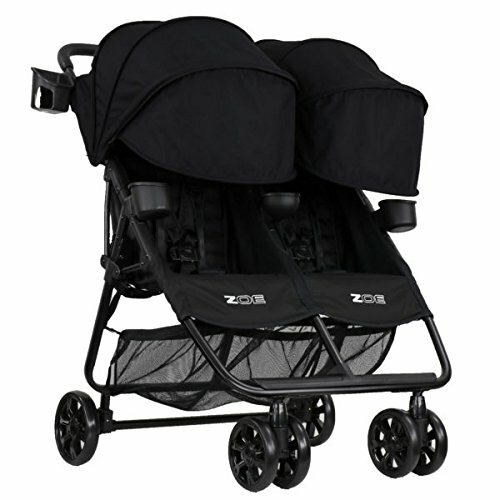 These strollers can work well in the case of twins or children very close in age. In models with more features, you will often find independently reclining seats so each child can select their own preference. Some side-by-side strollers also have a cupholder for each little one, and sometimes even a small, removable snack tray. The benefits of a side-by-side stroller while traveling are that you can find extremely lightweight options if you look carefully, and many are quite affordable. 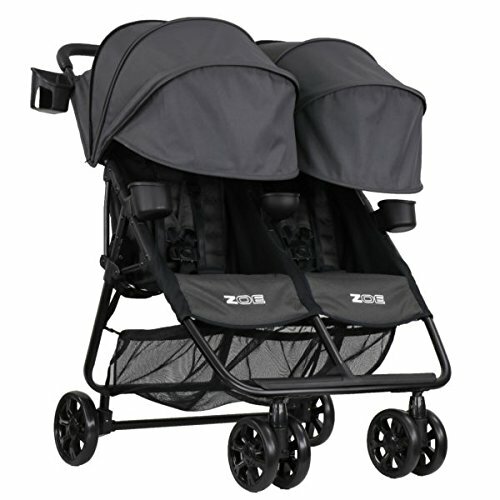 Depending on the brand and version, these can also fold down more comfortably than some other types of double strollers. The problems with side-by-side travel strollers are that they are wider than tandem or modular strollers, making it more challenging to get through narrow doorways or crowds of people. 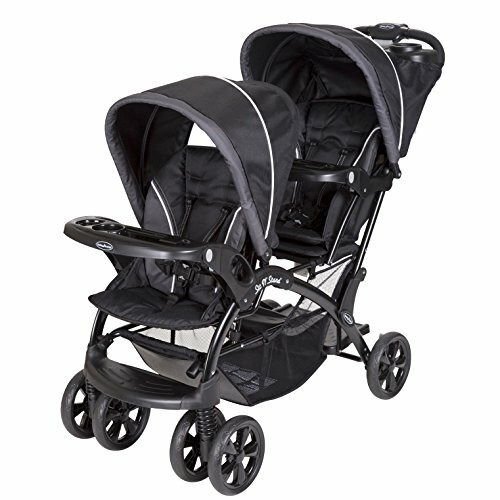 These types of double strollers are also usually made for babies who can hold their heads up, if not sit up completely. If you want a side-by-side stroller with a full recline so you can use it with an infant, they are out there. 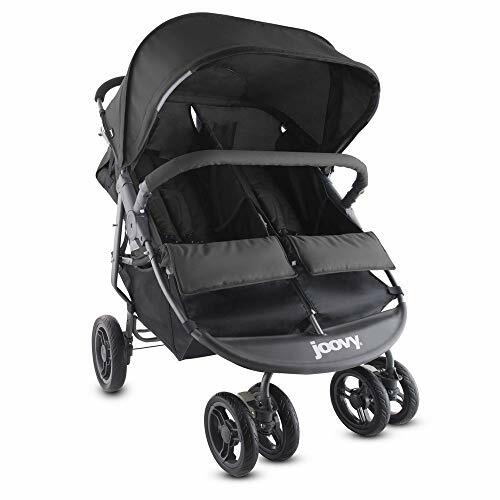 The Joovy Twin Groove Ultralight is an excellent example of a reclining umbrella stroller. It may take a little stroller research to find one that is suitable for a newborn, lightweight, and super affordable. Among the array of side-by-side double strollers, there are two popular types you will find most often: joggers and umbrella strollers. Double joggers are ideal for those who will occasionally travel with their double stroller, but also plan to use it for daily use. These strollers are also recommended for parents who are taking a trip and are also dedicated runners or plan to hike with little ones in the buggy over slightly bumpy terrain. An umbrella stroller is often the most economical version of a stroller and folds down and back open quickly like an umbrella. These double strollers are usually lightweight, making them a dream for airline travel or parents who absolutely refuse to travel with a bulky, heavy double stroller. Umbrella strollers tend to come with fewer features than other types of prams. If you invest in a quality model, you can get a decently sized sun canopy for the kids, cupholders, and sometimes even individually reclining seats. 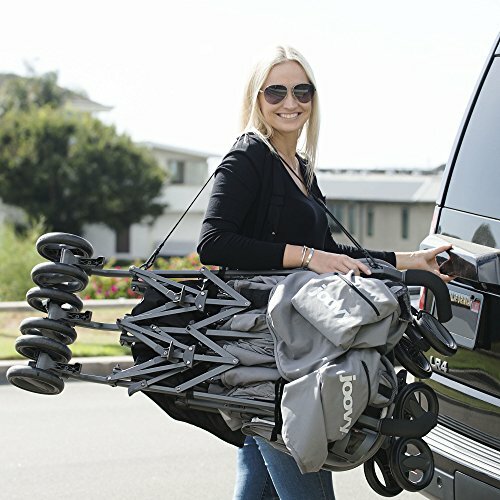 Double umbrella strollers are a fantastic backup to have for those who need to fly with babies often but do not plan on strolling over extremely bumpy terrain. A double stroller that seats one child in front of the other, or in-line with each other, is called a tandem stroller. Tandem travel strollers can afford you the convenience of a narrower base, making it more comfortable to navigate through tight doorways or crowded areas. The downside to this feature is that the stroller is longer in the front. If you ever misjudged your depth perception on the length of a shopping cart, for example, the same problem can present itself with a tandem stroller. Until you get an accurate feel for exactly how much length you are pushing in front of your, these strollers can be tricky to maneuver in crowds. Another drawback to many tandem strollers for travel is their bulk and the ease of folding them down. 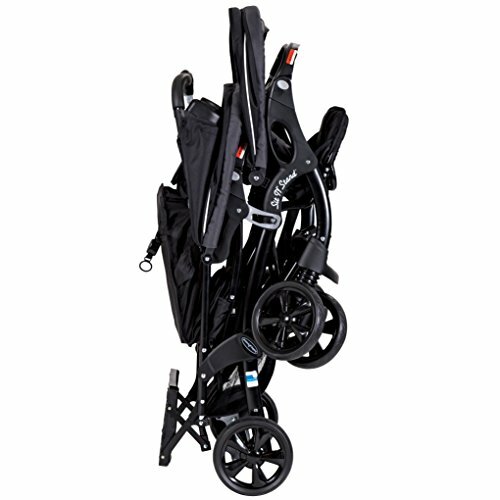 Some models are lightweight and once the children are out of the stroller, can fold relatively compact. Not many tandem strollers compete with an extremely light to lift, efficiently-designed side-by-side umbrella stroller in that arena, though. When traveling with infants, in particular, a tandem travel stroller can work exceptionally, however. Several of these double prams are compatible with infant car seats that can click into the stroller base. When you need to stroll your babies in the airport, and then carry them in their travel car seat, this can make life so much more comfortable. Tandem travel strollers are ideal for car trips for that reason, too. You just fold up the stroller and keep it in the truck, have your babies secured in their car seats, and then click the car seats into the stroller base once you arrive at your destination, or stop to stretch your legs. A sit and stand double stroller also explains itself well with the name: one child sits, while the other child has the option of sitting or standing on a small platform behind the other child. These are a version of tandem travel strollers that work well for those who have kids who vary a few years in age. Sit and Stand strollers are also excellent for parents who are worried about an especially active child staying with you if they refuse to spend a long time sitting in a stroller. You can keep an infant or young toddler in the front seat, and an older toddler or young child on the standing platform. Just as with traditional tandem strollers, you will need to get used to the front length of these models. We like these for parents who plan to travel to crowded tourist destinations and already have understandable anxiety about keeping an eye on the older child. For super active kids, giving them a toy or two to play with while strolling around in the stand position work well for some. Other kids tend to enjoy the sensation of being pushed while standing and getting to survey the excitement around them. A modular stroller, also known as a travel system is another version of an in-line (not side-by-side) model. Modular, or travel system strollers are the ultimate in versatility with their various “modes.” With these prams, you can click in a car seat, face it toward you, or face it away from you, add on a toddler seat, click in two car seats, or turn the whole thing into a single or double outward facing toddler stroller. Talk about variety, right? These are ideal for growing families, as well as parents who will have an older child growing out of the double stroller soon. Picking a stroller based only on brand should not be a crucial element in making your decision unless you have infant car seats that you want to be sure will click-in correctly to the stroller. The most important factors in picking in a double travel stroller are safety, quality of construction, authentic user reviews, and a decent warranty or return policy (even if the company is not exceptionally well known). Some of our favorites are popular brands, while others that have impressed us are by much lesser known manufacturers. That being said, if the brand is essential to you, some of the more reliable companies that sell double travel strollers are Joovy, Graco, Baby Jogger, BOB Strollers, Delta Children, and Baby Trend. 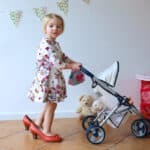 These companies produce some of the more popular and highly-rated travel strollers and make several options for doubles. Buying a stroller can be costly, but when you make it a double, the price of the stroller tends to jump. 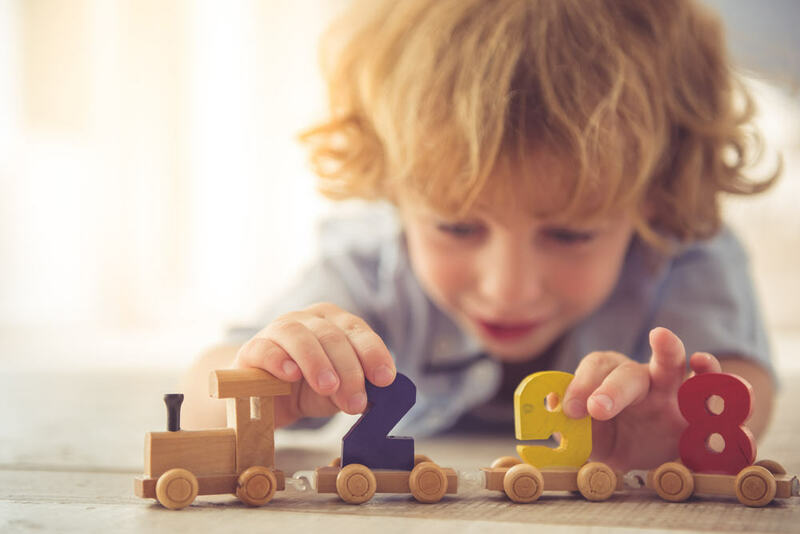 Extra materials and components and doubling up on ensuring the safety of little ones can cost manufacturers more, which means, unfortunately, you will likely have to spend a bit extra than a single stroller of the same model. That’s why, when buying a double stroller, it is essential for you to consider any reservations you have about a product or evaluate things you are wondering about before purchasing. Q: What should I look for in a double travel stroller? A: The most significant factors in selecting a double travel stroller are the following. Safety and quality of construction. Quick and easy folding capability. A low stroller weight if you need to lift it overhead. Durability if you’re taking an outdoorsy trip and plan to hike with it. Compatibility with car seats if necessary. Lots of positive reviews from actual parents. A low price if you’re particularly concerned about potential damage while checking with luggage. Q: How do I go through airport security with a double stroller? A: Getting through airport security with a double stroller can be a hassle, but there are plenty of tips to help you out. If you are prepared for your trip and know what to expect, it will move much more smoothly and efficiently. You will need to take your children and all of their things out of the stroller before going through security. When you keep items for babies in clear bags, you can quickly put on the conveyer belt and then toss back in the storage space of the stroller or in a carry on is a smart idea. Do not forget about bottles, breastmilk, and snacks. You can inform a TSA officer that you do not want breastmilk or food x-rayed or opened, but you may have to undergo a few additional screening steps if you opt for this. Food must be in unopened packaged, and liquids must be in containers of 3.4 fluid ounces or less. Some foods, such as yogurt, count as a liquid. If you’re unsure about a food item, think of it this way: if you can spread or smear it, TSA will usually consider it a liquid. You will likely need to push the stroller—sans children—through the detectors or hoist it up, folded down, onto the conveyor for inspection. Some security agents will swab your stroller to make sure it does not contain dangerous material. Q: Can you check a double stroller at your airline gate? A: Many airlines will actually allow you to check your stroller in as luggage at the gate, but not all of them permit this. Call your selected airline to find out before you leave for your trip. If you are not able to check it at the gate, have a baby wearing device such as a wrap or a carrier with you after you check the stroller in with your other luggage at the desk can help you walk through the airport more comfortably. Do take note, most airlines no longer allow you to check in non-folding strollers that weigh over 20 pounds at your gate. A stroller as such will have to be checked in with luggage at the desk. If you have baby wraps or carriers, this might be simpler if your gate is close by. Q: Will a double stroller work with both an infant and a child? A: Yes, depending on the type of double stroller you select. For a newborn and an active child, we recommend a sit and stand double stroller. 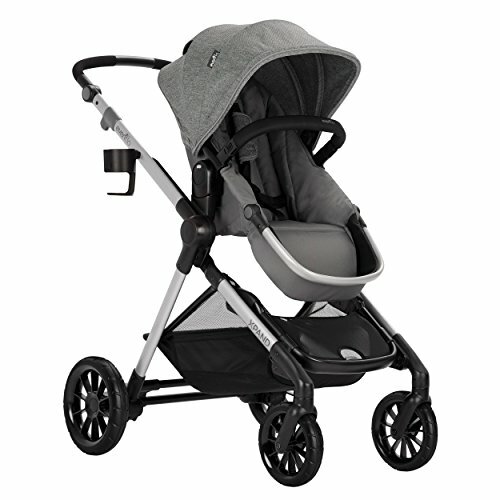 Some umbrella strollers like the Joovy Twin Groove Ultralight Umbrella Stroller offer a nearly full recline for infants. For road trips, a tandem stroller is our favorite for a child and infant double stroller. With these in-line options, you can click in the infant car seat, and buckle your older child into the regular stroller seat to ride together. Q: Can you put a double umbrella stroller in an overhead bin? A: You will want to check with your specific airline first, but generally, most lightweight umbrella strollers can go in an overhead bin on an aircraft. That is, taking into consideration how crowded the flight is—you may have trouble with the room because of other passengers’ luggage. Q: What should I bring with me on a flight or road trip with kids? Snacks and drinks (TSA approved if flying). Disinfectant wipes for tray tables or unexpected messes. Kid’s motion sickness medicine or candied ginger (ginger helps with nausea). A small bag for trash, unexpected nausea, or used wet wipes. Cold-prevention nasal swabs if traveling during cold and flu season. Pressure reducing ear relief plugs for flying. Tablets, books, or small electronics for moments you need kids occupied. Small, affordable toys or coloring books. Baby lotion in a container of 3.4 ounces or less. A spare set of clothes in a carry-on bag. Skin-safe wet wipes and dry wipes for spills. Baby wrap or carrier if traveling with infants. Traveling with two or more children can be a challenge, but also incredibly rewarding. 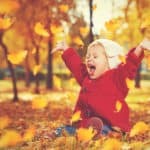 Prepare yourself early by looking into tips for getting through a flight or road trip with kids. If you’re flying with multiple kids, call your airline to check with them about stroller requirements and gate stroller check. If you’re qualified to do pre-check-in online, your children are, also. This can speed the process along at an airport. If you cannot check your stroller at the gate, be prepared for the worst (a long walk to your gate) and look into whether your airport has stroller rental, or if you need to invest in a babywearing wrap or carrier. One last helpful tip: prevent getting scratches on your stroller with an airline stroller check bag. There is an ample amount of info available to help you glide through traveling with multiple kids easier. For example, children under the age of 12-years-old do not have to remove shoes when going through airport security. Prepare, plan, and pack smart, and you can move through your car trip or flight with multiple children easier than you imagined. That said, if you looked through all the possibilities for double travel strollers and you feel like the options are overwhelming, our personal recommendation is the Delta Children LX Side by Side Tandem Umbrella Stroller. A super compact, quick-folding umbrella stroller is our favorite for travel, and this model has hundreds and hundreds of outstanding reviews from parents. The fantastic price on this side-by-side takes some of the worries out of traveling with a pricey stroller that could get damaged in-flight and during trip adventures. For most people, this stroller will suit their needs for basic travel. You can buy the Delta Children LX Side by Side Umbrella Stroller here. Maclaren Mark II Stroller Review | The lightest umbrella stroller ever!